All guitar players dream of finding something amazing, and ideally cheap, in a pawn shop but few of us do. It takes stupid amounts of persistence and a even greater amount of luck. To be hounest, most of the time they are just full of crap and you have to go almost daily since bargains don’t tend to hang around for long. Then again, sometimes you can find something awesome that they have missed the value of because it wasn’t that easy to Google. Like a Tokai Love Rock Made in Japan from 1991 that didn’t have the Made in Japan marking on it. 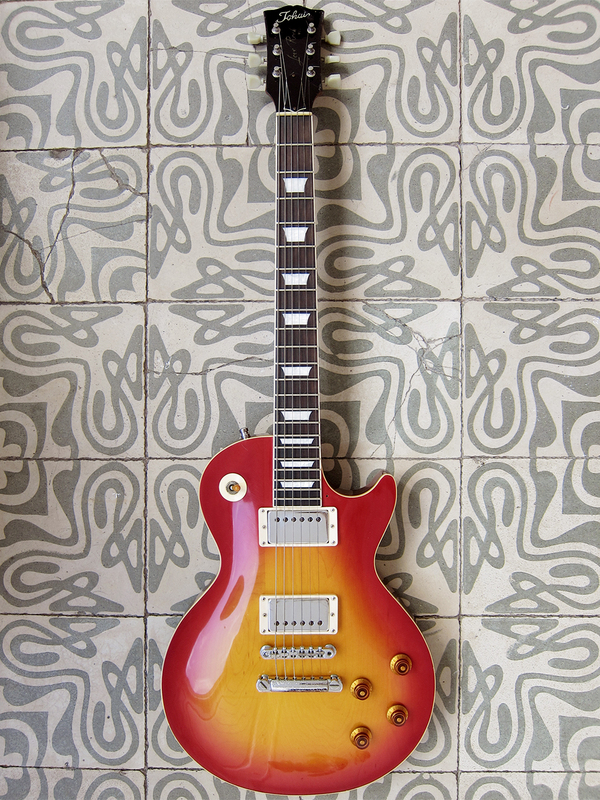 I found this guitar a couple of weeks ago in a pawn shop, or cash converter as they tend to be called here in Spain. It was in a really bad state, I mean I have never seen a dirtier guitar in my life, a thick layer or grease and grime on the fretboard and bridge. The previous owner must have sweat like a pig because all the screw were black of rust and impossible to get out. I actually had to drill them out to change the humbucker mounting screws so I could adjust the pickups. I got this image in my head of a rather hairy and sweaty gent that had been playing Sweet Home Alabama on this guitar for the past 20 years and really gigging the hell out of it. I soaked the bridge in normal washing liquid over night and then cleaned it with an old toothbrush, my favourite cleaning tool. I bought this guitar on a whim, I mean I loved the neck, I hardly dared to touch it because it was so dirty, but the body was pretty well worn and one of the pots was broken. On top of that I had no clue if it was made in Japan, Korea, China or it might not even be a real Tokai, I read somewhere about tons of fake Tokai’s, or Fakai’s flooding the market in Canada. If I didn’t find cleaning and making guitars look pretty the best past time in the world I would probably not have bought it, but I do, so I got it straight away. I cleaned it up and took it apart and started to look for the clues. The night I found here, unclean and weary. I remembered that I had read that the Japan made Tokai’s had 2 screws for the trussrod cover while the Korean and Chinese had 3. Mine has 2, check. Then I noticed that both the bridge and stopbar had Made in Japan stamped under, check. Then I read on My Les Paul that the Japanese guitars has square holes from the routing under the pickups and diagonal wiring, mine has both, check. I actually read here that Tokai are still using the same router that they have used since the 1970’s so all guitars made by them, Greco briefly and recently Burny, should have this routing if it’s made in Japan. I thought that was pretty cool. To be sure I did a bit more research on Tokai registry and even did a few posts myself on different forums to see what people said. They all agreed, it’s a Tokai Love Rock Made in Japan from 1991. Now, all dolled up. 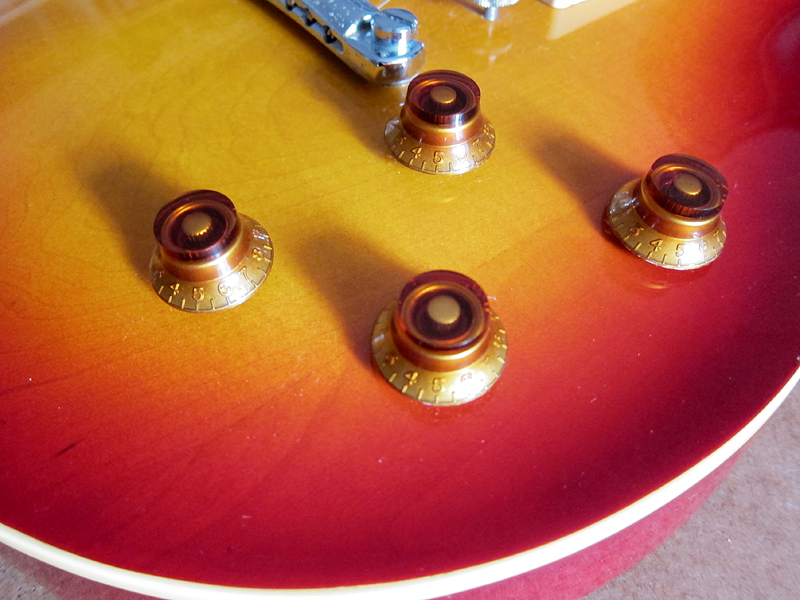 I just need to change the broken pot, a set of new amber knobs are already on their way from China. A quick update, in mid-March 2013 the Tokai got the broken pot fixed. I also decided to change the frets, something you can read about here and here. How did it go, did you get the guitar? I have this exact same model and its my favorite guitar of all time. The frustrating thing is how little inf there is about this era online. Apparently they lost all their catalogs from the early 90’s so there’s no official specs. Any idea whether its nitro or poly finish?